Now that the French Secret Services and their foreign associates have read the accounts of ‘false flag’ suspicion in the non-mainstream media, the French Government had to resort immediately to all sorts of doubt deviating maneuvers. 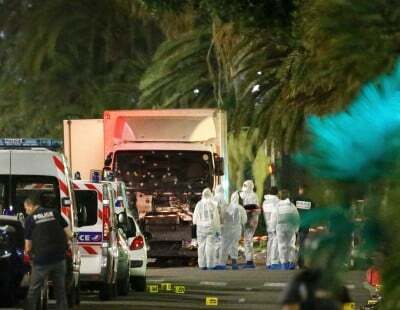 – The truck driven through the Bastille Day celebrating masses on Boulevard des Anglais, suddenly did not break through the barricade protecting the strip as a pedestrian area for the celebration, but it entered through an unprotected side-street. The ‘drive’ was allegedly prepared days in advance, even with dry runs, according to street cameras and telephone conversations between Mohamed Lahouaiej Bouhlel (MLB), the driver of the truck, and a bunch of friends, whom he also asked to supply him with weapons. Strangely, the videos and telephone conversations emerged just days later. – Judging from the bullet holes in the truck’s cabin, it doesn’t look like the police was actually shooting at the driver. Has anybody seen him dead? – About five or six of MLB’s sudden associates where in the meantime apprehended for questioning. The number of associates varies depending on the mainstream media you read or listen to. – Mr. MLB’s psychiatrist in Tunisia has revealed that his patient had indeed a violent and unstable personality – hello! – did you know that MLB, a destitute man, the alleged perpetrator of the crime, had a psychiatrist in Tunisia? – Well, we can’t ask him anymore. He is dead – or is he? – TeleSur reported that MLB’s brother in Tunisia was surprised having received a sudden transfer of € 100,000 from his brother, as compared to the former small transfers corresponding to MLB’s previously reported poverty and debt. Is this a hint to make us believe that he got paid a lot of money to carry out this mass-murder on behalf of Daesh? France as a country and through NATO is supporting ISIS-Daesh with training, weapons and money, along with Washington and Washington’s other European and Mid-Eastern vassals. Why would Daesh attack France? May this be a dual complot, Daesh cells in connivance with the highest French authorities, is ordered to attack France yet again, so as to incite France and other US vassals to keep funding more bombing campaigns in Syria, Iraq and Libya, knowing quite well that to the contrary of what the mainstream media (msm) wants us to believe, the bombs are not meant to subdue and eliminate Daesh, but rather to conquer Syria, Iraq, Libya and more to come – of course, on behalf of the empire. Daesh-IS-ISIS are in fact NATO’s foot soldiers. After all, Mr. Hollande and his Minister of Defense have in the past boasted of supporting Al-Nusra on behalf of Washington, of course, since Washington declared them as ‘moderate rebels’ who have to be helped to oust the legitimate President Al Assad, no matter that Pentagon observers concluded that Al-Nusra was identical with the Islamic State. This definition of terrorism serves the purpose. It allows building up more hatred against Muslims, more public support to go to war against them, more profit for the war industry – and, foremost, allows the elite and real perpetrators of such crimes and wars moving ever a step closer to Full Spectrum Dominance. And, We, the People, remain oblivious to this Bigger Picture. This, like the previous two French massacres – and also the one in Brussels earlier this year – are botched cases of the security agencies in charge of organizing them. As in the previous cases, the media will now be told to shut up. The case will be forgotten fast; until the next massacre, when innocent people are being murdered to steadily advance the cause of a small elite to whom our western governments are enslaved. Since the ascent of neoliberalism in the 1980s, our western world’s leaders have gradually turned to criminals and associates of an industry of legalized thieves, killers, drug-traffickers and liars. Hard to believe? Just look at the FED (Federal Reserve), ECB (European Central Bank), BIS (Bank for International Settlement), Wall Street; the war industry, DEA (Drug Enforcement Administration), and the six giant Anglo-Zionist media corporations that control 90% of the western news. Take Obama, he prides himself to personally approve every drone killing, extra-judiciary killings are assassinations. We, the People, have become numb to these events. The president of the United States of America, the head of the self-proclaimed empire, is effectively a murderer, has become the new normal. The fact that Hollande, Cameron, Merkel and many other peons of his empire are also murderers cumleaders (sic) of western countries around the globe – of billions of people – is swallowed without a whimper by the masses. Where have we gone? What have we become? Where is our self-esteem, our respect for the life of our fellow human-beings – our deep-rooted original sense of ethics and solidarity? Peter Koenig is an economist and geopolitical analyst. He is also a former World Bank staff and worked extensively around the world in the fields of environment and water resources. He writes regularly for Global Research, ICH, RT, Sputnik, PressTV, Chinese 4th Media, TeleSUR, The Vineyard of The Saker Blog, and other internet sites. He is the author ofImplosion – An Economic Thriller about War, Environmental Destruction and Corporate Greed – fiction based on facts and on 30 years of World Bank experience around the globe. He is also a co-author of The World Order and Revolution! – Essays from the Resistance.